Step One: Defining--Define the problem you're trying to solve. Step Two: Borrowing--Borrow ideas from places with a similar problem. Step Three: Combining--Connect and combine these borrowed ideas. Step Four: Incubating--Allow the combinations to incubate into a solution. Step Five: Judging--Identify the strength and weakness of the solution. Step Six: Enhancing--Eliminate the weak points while enhancing the strong ones. Each chapter features real-life examples of brilliant borrowers, including profiles of Larry Page and Sergey Brin (the Google guys), Bill Gates, George Lucas, Steve Jobs, Albert Einstein, and other creative thinkers. Murray used these methods to re-create his own career and he shows how you can harness them to find your own creative solutions. First you copy, then you create. And the further from your own company you look, the more creative the solution. In the new bible of business innovation, renowned creativity expert David Kord Murray reveals the key to the creative process: borrowing. There is no such thing as a truly original idea. Great thinkers throughout history have understood this and used it to their advantage. Bill Gates "borrowed brilliance" to create Microsoft, Steve Jobs "borrowed" to create the Mac, and long before that Sir Isaac Newton used similar thinking techniques to arrive at his theory of gravity. 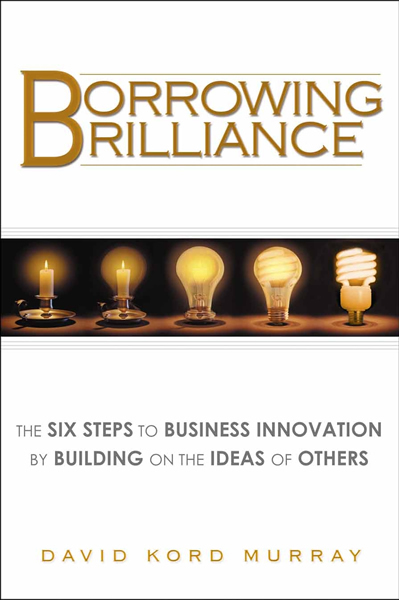 Borrowing Brilliance challenges our notions of intellectual property and authorship, explores the evolution of a creative idea, and takes us step-by-step through Murray's own unique thought process, which combines analytical and non-traditional thinking techniques. Murray's six step "borrowing" process is one that anyone can master to build business innovation. Murray combines practical lessons with stories from his own career, as well as the careers of brilliant borrowers past and present. Most people believe creativity is a gift, that it can't be taught, that it's innate in your thinking process and either you have it or you don't. But Murray lifts the veil off the creative process, bringing it from the shadows of the subconscious mind into the conscious world. Creativity is not the result of divine intervention; it is something that can be learned and it is easily within reach. "Creativity" bestseller on Amazon.com, 800 CEO Reads "Best Business Book of 2009"
"A wonderfully enjoyable tour of the creative process. Murray's lively description of how he used these tools to create his own products is a major plus. People will be stealing from this work for years to come!" "We met in strange places: Carlsbad, Lake Tahoe, Milwaukee, Kansas City. And so I spent my years with David Murray, just as zany, articulate, well-read, and completely unpredictable as is his book. Ah, the book: Dave Murray in person is just like his book, only more so. 'Break the rules,' he said. We broke them. 'I'm thinking of writing a book about this,' he said. I encouraged him. And here it is, how to be brilliant and innovative. New ideas are always amalgamations of old ones. Borrowed. Murray makes it seem simple, but don't be deceived. Everything he says is true." "Everything a business book should be. A great concept brilliantly expressed in an interesting and well-written book." "Borrowing Brilliance is truly creative brilliance! It is simple, easy to read...it's magical. David Murray shared his life's personal stories juxtaposed with his six simple steps to business innovation. His book brings to life these steps through building on the ideas of others. You can borrow and use his six steps and explode with fresh new ideas the day after finishing Borrowing Brilliance."